NieR: Automata is one of the most remarkable games to come out of Japan in years, and has rightly been hailed as a classic on PS4. At E3 2018 it was confirmed that the title would also be coming to Xbox One, and during a live stream featuring director Yoko Taro, producer Yosuke Saito and designer Takahisa Taura, the inevitable question of a Switch port reared its head. It was a reasonably light-hearted exchange and probably shouldn't be taken too literally, but Taro's enthusiasm for a Switch port seems genuine enough - and given the massive potential audience on that system, it would surely make commercial sense to publisher Square Enix, too. Do you think NieR could be ported to Switch, or might it be too ambitious a project? Let us know your thoughts with a comment. Didn't Platinum say back when it was coming to PS4 that all they needed was SE to give them the go ahead? The game is great. Would love to play it again on Switch, if they could get it to run decently enough. I love Yoko Taro. He seems like such a quirky and fun guy. I'll buy it if it ever happens. @Kimyonaakuma That's why I wish Nintendo would add a bit more power to their consoles. So it can handle some 3rd party games. lol What a great exchange between them! So much character there. I would love to see both of these on the Switch. I haven't played Automata, but the first one was incredibly good. I didn't care for the game myself but I guess for those who care it could be nice. Honestly I would be more interested in the Original Nier since I never got to play that. I'd love to play this but can't imagine it would be out any time soon even if they got the thumbs up to begin now. Come on squareenix, put pay to what you say! I have to say, a port of NieR Automata would go a long way to making up for the disappointment of Nintendo’s hugely uninspiring E3. Only reason I've yet to play it was the fact a Switch port might be on the cards. C'mon gimme my Switch NieR! Never understood the hype about NieR, even though I love PG. Still need to finish the other endings, but meh, don't feel like it. @liljmoore Yeah I feel the same way, they finally have third party developers that are interested but the Switch isn't going to be good enough for some of them. But Nintendo also had to balance a home console with somewhat decent power consumption for a handheld, it wasn't ever going to be at a Xbox/PS4 level. Hopefully they'll port the old collections over and we might get 3 if they sell well. It might have the same problem as DQ XI though where the version of Unreal Engine is too old for an easy port. @mattmayatt Lol. I feel like every studio out there is saying this exact thing right now. Can't wait to see what Panic Button announces next. Whatever witchcraft they use to port the unportable is worth it. I don't think we'll see Nier ported by Platinum. Seems to me like they have enough big projects going right now. NieR Automata is absolutely fantastic. It might be an unpopular opinion to share on a Nintendo fan site, but for me NieR is in a different league to Bayonetta. I'd buy it again for Switch in a heartbeat. I have it on PS4 but I don't get much sofa time these days. @Curlybobs Yep I agree. I found the combat in Bayonetta more button mashy, and overall the game was less engaging to me than Nier Automata. I mean, Square says it aboul litteraly every game they publish. Pretty much my favorite game to come out this generation. I'd love to see it on Switch, but I'm not expecting it to happen. It appeared to be quite the technical marvel. I'm far more interested in great games being developed exclusively for Switch or with Switch in mind, as opposed to other systems' leftovers, no matter how awesome they are. This game would be an absolute mess on the Switch. Don't tarnish the game's name with a port to a platform that can't do it justice. @Menchi187 The game is somewhat of a mess on pc so there’s not much of a risk of tarnishing the game’s name. I’m sure in the right hands this would be excellent on switch. Kind of a silly attitude to have, anyway. @bogofet Game runs flawlessly on my PC. Then again I don't try run everything with a 750TI and call it a mess when it runs like dirt. My point being it'd be terrible on Switch. ...That’s all of ‘em, innit? Would be all over this on Switch. Nier Automata is a fun game, but it barely ran on the PS4 and PC. If it ever does come to the Switch, lower your expectations. i guess you can cross your fingers N goes back into home consoles but i think they're out of that fight. TKO from sony/ms there. and yeah; it's a rough game even on PC. poor coding most likely but it is what it is. i guess 300p 20fps on the switch is not going to cut it. Yeah, instead they did an Xbox port. Basically this is the go to answer, instead of "no".... When asked abut the Switch version. @Curlybobs I've played both Bayonettas and only a little bit of Nier, but you're absolutely right. In terms of music, story, characters, themes, world-building, etc. Nier is absolutely on another level. I actually also prefer the combat: Bayonetta has deeper combat, but I don't really care for the scoring system or the complex combos. Was very tempted to pick this up on Xbox, but now I feel it might be worth waiting a bit just in case. That makes 2 of us. I really really want this one to happen. My body is ready when they are. Of course, the first two Niers would be very welcome as well (maybe even more so since both appear stuck on Gen 7 consoles as hard as Eternal Sonata and RoF; Automata at least saw a PC release and looks compromisingly manageable on GPD), but even this game alone would be awesome to play without RP streams. @Menchi187 My point is a switch port is a worthy effort as I enjoyed my experience with the game despite it's performance issues on my pc. I'd want that too but it takes too long. Already bought the game on Steam. They should've released it on all platforms simultaneously. Nier was my GOTY last year. It deserves to have more people play it. The soundtrack alone is incredible. Have a feeling you might be waiting a long while for a Switch version. NieR: Automata is probably the best JRPG to get published by SquareEnix in a long time. If you have another way to get it, I'd say go for it rather than wait for something that may never happen. @Gamer83 You are right, but I have very little time to play in front of the TV at home. Most likely a purchase of an RPG will lead to it sitting unplayed on my backlog. I got Wolfenstein 2 when I bought the Xbox as I figured the wait for the Switch version would be ages. Now the Switch version has almost arrived and I still haven't played it on Xbox! As much as I would like to see some good 'ol up skirt hack and slash. I don't think that it will happen. 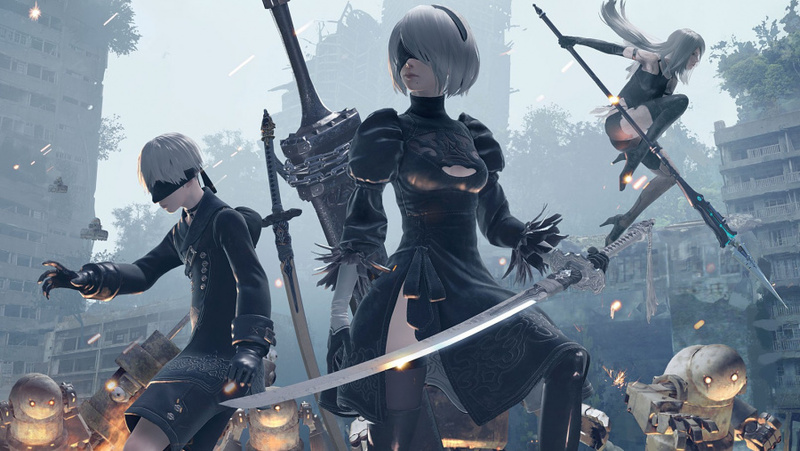 NieR Automata is best played on PC, with the Far mod. I've played over 40 hours of it on PC with no crashes, slow cutscenes, etc. As for a Switch version, I have no interest in it. It's already quite an ugly game at times, I think it would look even worse running on the Switch. I'm only here for the subtitle to the article. Not pressed about it since I already have (and love) it on ps4. But i'd buy again for Switch, just to support Taro-san. Yes, I want it on Switch please! Wowza, it'd be great if NieR Automata made it onto the Switch although I wonder how'd it run considering it taxed the consoles a fair bit and the PC as well. It's a different thing that the PC version was badly optimized and needs a fan patch to work. Was an incredible game from its story and presentation to its combat and music. The DLC final arena challenge was pretty tough as well, very nice nostalgia tour through all the game bosses. Too bad A2's sections were the smallest though. I'd but it again on switch.